It must be the rye…after spending a week here in Copenhagen, I have concluded that these are the healthiest, happiest people in the world and the only thing that sets them apart from us is a dense, little loaf of malty bread. Although wheat bread reigns supreme in North American supermarkets, choosing whole rye products more often has multiple benefits (obviously)! For one, rye bread is an excellent source of dietary fiber, starch, protein and a significant number of essential vitamins (Bs and vitamin E) and minerals (iron, magnesium and zinc). The greatest thing about rye however, is that it contains both insoluble and soluble fiber. Insoluble fiber helps keep you “regular” by increasing bulk, softening stools (sorry, I had to use that word) and shortening the transit time through the intestinal tract. Insoluble fiber is the predominant type of fiber in bread, which plays an important role in keeping you regular and helps to eliminate toxins, which help to maintain a healthy digestive system. Soluble fiber undergoes metabolic processing via fermentation, yielding end products with broad, significant health effects including helping to maintain heart health and manage blood glucose levels. Lately, there has been a lot of hype surrounding pro and prebiotics. The Probiotic talk I will save for another post, but I will say that the soluble fiber in rye bread is considered a prebiotic. Prebiotics are non-digestible food ingredients found in foods such as leeks, onions, garlic, bananas, asparagus, chicory and whole grains (including wheat, rye, barley and oats). Because prebiotics are fermentable fibers, they help maintain gut functions. Most importantly, prebiotics remain undigested until they reach the colon where they become an important food source for the friendly bacteria (probiotics) in our gut, helping them to flourish and grow in numbers. This is a very good thing. 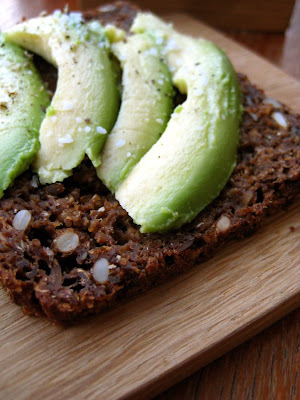 Because of its high fiber content, rye bread is incredibly filling and quickly gives a feeling of satiety. This would be a great addition to anyone’s diet if they were trying to lose weight. Look for the darkest rye bread you can find and make sure that it does not contain any caramel colour! Many commerical bakeries add this to the dough so that the bread looks like rye, but the ingredient list will reveal wheat is the main attraction. The typical Danish way to eat a rye bread sandwich is in fact, open-faced with fish, pâté, or sliced meats on top. I certainly prefer hummus or avocado and a little sea salt myself, but the possibilities are endless. I also like the open-face sandwich concept because it’s like you get to eat twice as much! 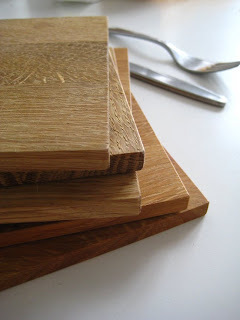 They even have these cute little wooden boards in all homes that are specifically for rye bread sandwiches, to use instead of plates, whose raised edges would not allow for spreading. So clever! I thought that it was just a stereotype that the Danes eat a couple slices of rye bread a day, but you know, sometimes stereotypes are true. And as it turns out, they even have blond hair. Dear Sarah: I found this rye bread in your recipe index but where is the recipe? Please advise. Thank you. Cheri P.S. All the recipes on your site are they in your cookbook and if so, which one? FYI, they sell a bread mix for this at Ikea food shops. This rye bread looks wonderful, and very dark. What gives it the deep color? Is anything added to the rye? Would love to see/hear more about the famous open-faced sandwiches in Denmark. I will put the recipe idea in my “account” however, and maybe one of these days give it a try. Stay tuned! Thanks, Sarah! Would love to see a recipe!